The undersigned is directed to invite attention to Rule 10 of CCS (RP) Rules 2016 which prov ides, inter alia, that there shall be two dates f or increment namely 1st January and 1st July of every year , instead of the provision of one date of increment on the 1st July during the 6th Pay Commission pay structure. The Rule further provides that an employee shall be entitled to only one annual increment either on 1st January or 1st July depending on the date of appointment , promotion or grant of financial upgradation. 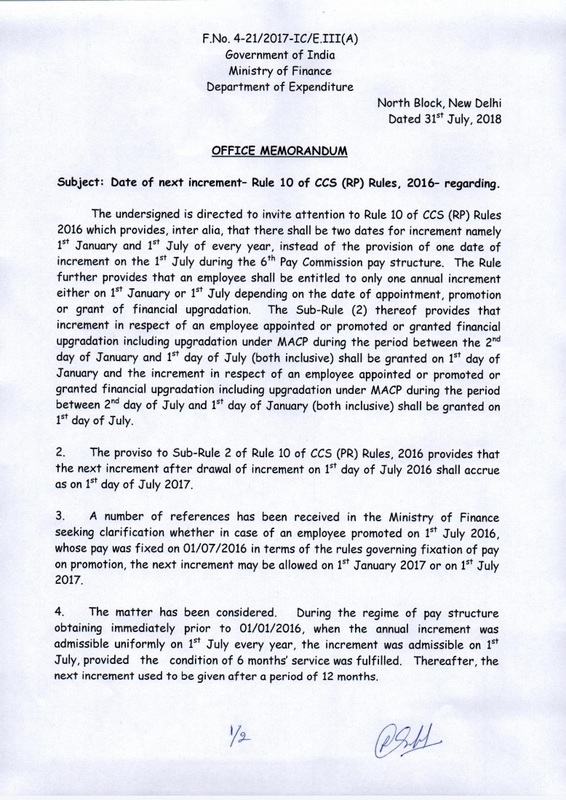 The Sub-Rule (2) thereof provides that increment in respect of an employee appointed or promoted or granted financial upgradation including upgradation under MACP during the period between the 2nd day of January and 1st day of July (both inclusive) shall be granted on 1st day of January and the increment in respect of an employee appointed or promoted or granted financial upgradation including upgradation under MACP during the period between 2nd day of July and 1st day of January (both inclusive) shall be granted on 1st day of July. 3. A number of references has been received in the Ministry of Finance seeking clarification whether in case of an employee promoted on 1st July 2016, whose pay was fixed on 01/07/2016 in terms of the rules governing fixation of pay on promotion , the next increment may be allowed on 1st January 2017 or on 1st July 2017. 4. The matter has been considered. 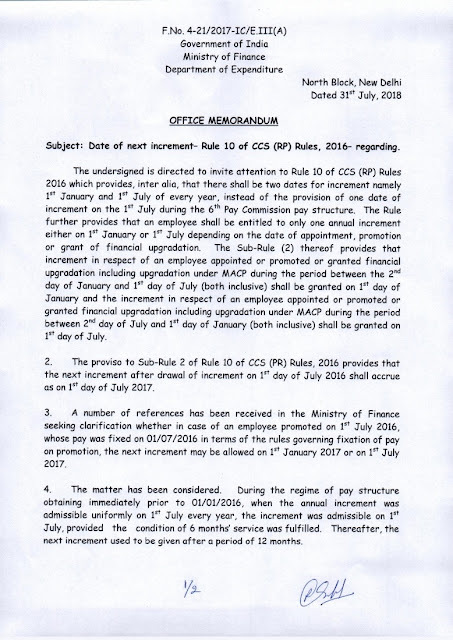 During the regime of pay structure obtaining immediately prior to 01/01/2016, when the annual increment was admissible uniformly on 1st July every year, the increment was admissible on 1st July, provided the condition of 6 months' service was fulfilled. 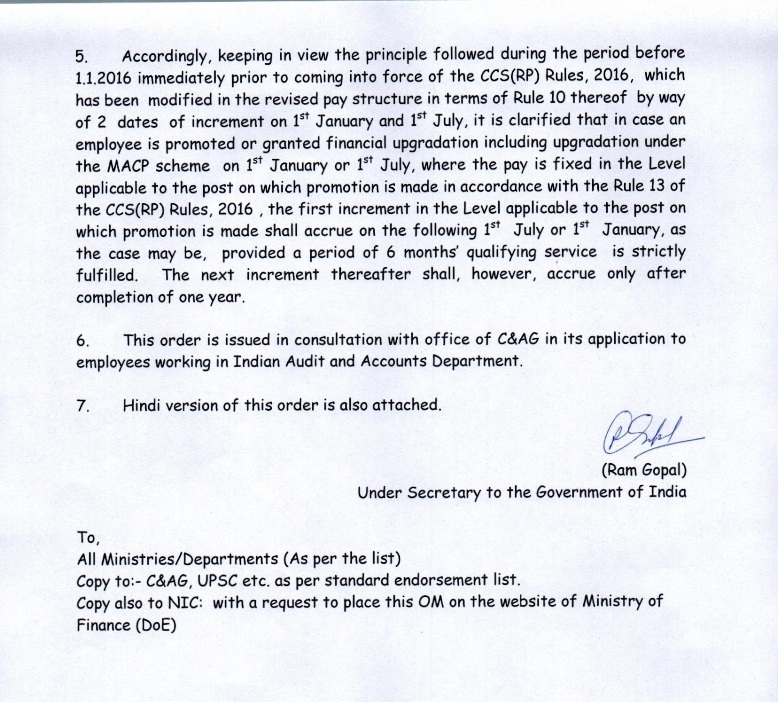 Thereafter, the next increment used to be given after a period of 12 months. 5. 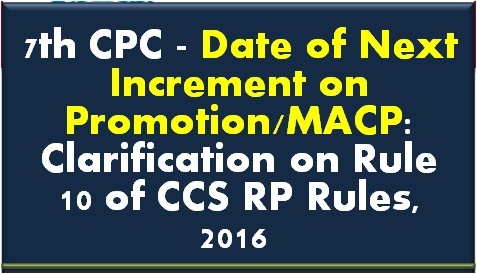 Accordingly, keeping in view the principle followed during the period before 1.1.2016 immediately prior to coming into force of the CCS(RP) Rules, 2016, which has been modified in the revised pay structure in terms of Rule 10 thereof by way of 2 dates of increment on 1st January and 1st July, it is clarified that in case an employee is promoted or granted financial upgradation including upgradation under the MACP scheme on 1st January or 1st July, where the pay is fixed in the Level applicable to the post on which promotion is made in accordance with the Rule 13 of the CCS(RP) Rules, 2016 , the first increment in the Level applicable to the post on which promotion is made shall accrue on the following 1st July or 1st January, as the case may be, provided a period of 6 months' qualifying service is strictly fulfilled. The next increment thereafter shall, however , accrue only after completion of one year . 6. 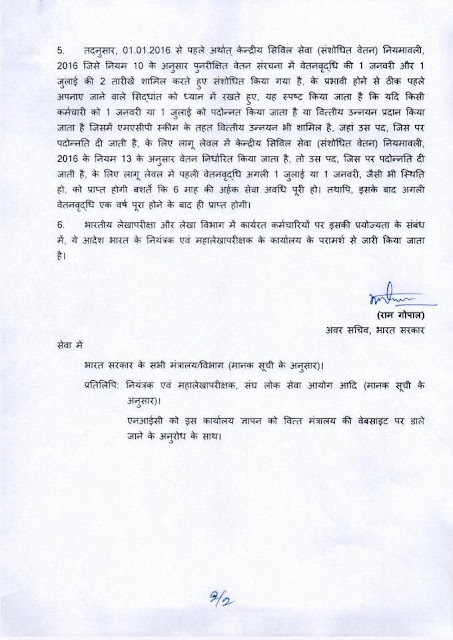 This order is issued in consultation with off ice of C&AG in its application to employees working in Indian Audit and Accounts Department.